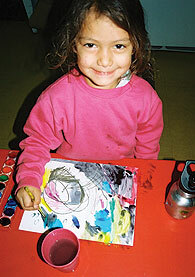 Another happy young artist applies paint to paper. If you can hold a brush, you can be an artist, at 2 or 102. There's something so satisfying about working with clay ... this young fellow seems to have a systematic approach! 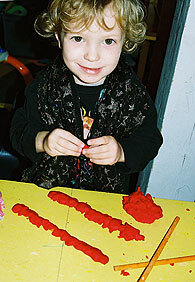 When Alex was two, he had no interest in keeping still long enough to make art. One day he surprised us by sitting down with a marker and drawing a very precise picture of an airplane with a point and seven windows. After that small success, he would arrive daily and set up his workspace, and over the next two years he explored art making that followed his specific interest of the day. He would make multiple copies of the same image until he had mastered it, and then he would move on. Alex and Jasper were very good friends, and Jasper liked sharks. So Alex drew sharks. The sharks were elongated circles with ridged backs and sharp teeth. Inside the shark was the outline of a little boy. Outside the shark was another boy. "Me in a monster. Me when I got out." Jasper wanted to make shark drawings but was unsure. Alex showed him how. He spent six months drawing his family (which included Jasper). He had a favorite orange shirt with a pumpkin face on it. He always drew himself with the pumpkin shirt on. His family included extra figures floating around, and these were carefully named "nobodies." In the beginning all the figures were outlined carefully with one color. Then one day he began to color in the family. Mom and sister were pink, and Dad was blue, but Alex the pumpkin boy is always orange with the face of a pumpkin on the shirt. "My hair is yellow," he said, and from that day forward his head was covered in yellow spirals. When presented with play dough, he recreated the pumpkin boy in 3-D with intricate details showing facial features and the pumpkin shirt. The letters "A-L-E-X" begin to appear in the work, tentatively at first and then more like a declaration. The pictures are accompanied by stories: "A Crocodile is finding a shark so he can eat it. A shark was on top of it. It is stuck in the ocean. The sky is very big." The water contains a shark and a larger green crocodile. The outlines can now be in different colors. These crocodiles continue to evolve with each rendition into more elaborate versions, many-legged with pointy teeth and scary sneers. They are "very bad. Eats like a pig." The family portrait returns with an upgrade. Faces have clear eyes, noses, and smiling mouths. The hands have made a dramatic and fabulous jump to become round palms with five triangular fingers on each hand. Only Alex has hair and a pumpkin shirt. Then my favorite! A green frog appears with six legs and a red tongue that springs out of his mouth and stretches around his body to catch the bug. Every day Alex arrives and prepares for the process: "Where is the paper, and why can't I find the green and red markers?" He is not willing to substitute a different color. One day a new possibility arises, and out emerges a new self-portrait. The pumpkin shirt is gone, and the round shapes are elongated. Now the shoes have found a new importance in the figure. His figures have boots with real heels! This magical period includes many images of multiple figures with elaborate faces, hands, and shoes. The outline is allowed to disappear in favor of solid colors representing the shapes of head, torso, arms, legs, and shoes. Drawing the Yellow Submarine has become the obsession of the hour, and he works the image over and over to mimic the lines on the movie poster. I encourage him to use a stencil, and this helps with the outline. Then one day when he has returned at age six for the summer, he creates a stencil-free version. He has mastered it after over fifty drawings. We are both very happy. Now Alex is grown up and comes to art classes on Saturday. He refuses to eat his lunch because he will miss out on "making art." Recently he made a stained-glass replica of his father's Prius using twenty-five separate pieces. He moves easily in and out of oil and water painting, drawing, collage, sculpture and even hand-sewing. He never asks what are we supposed to do today. Amazing child? Well, yes. They all are, in their own unique way. Art materials and time are essential to the process. 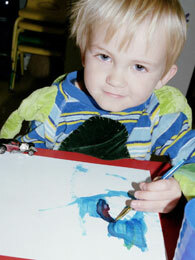 Contact Kay Curtis at (802) 257-7235 for information about Smile : Art Makings, Saturday art classes for children 5-12.